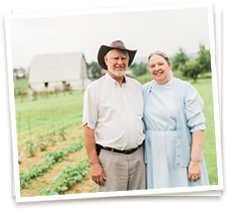 Enjoy With Integrity Our Fresh Brown All-Natural Eggs From Free-Range Layers On Our Non-GMO Farm. 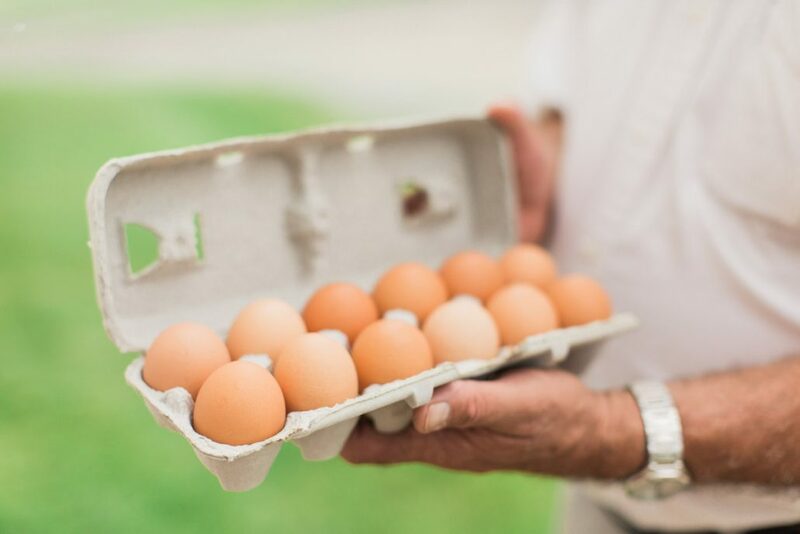 We welcome you to visit our storefront to pick up fresh all-natural eggs, grown right here at Sunrise Farms. We also supply wholesale eggs for resale and commercial uses. Call ahead for wholesale so we can have your order ready for you or arrange for regional delivery. 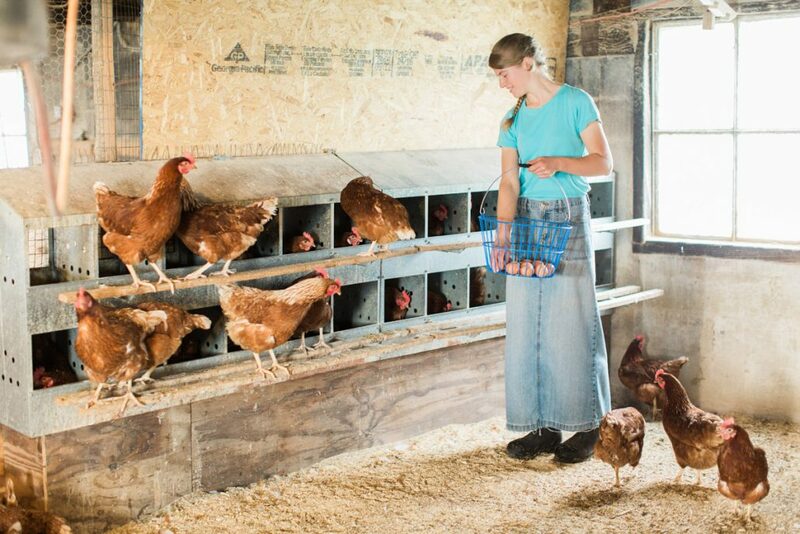 Ethical Farming Produces Delicious Eggs! 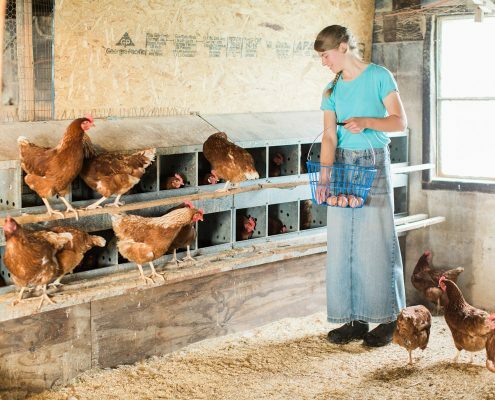 Our layer chickens enjoy free-range access to the outdoors, sleeping inside at night, and self-feeding from foraging and non-GMO feed. 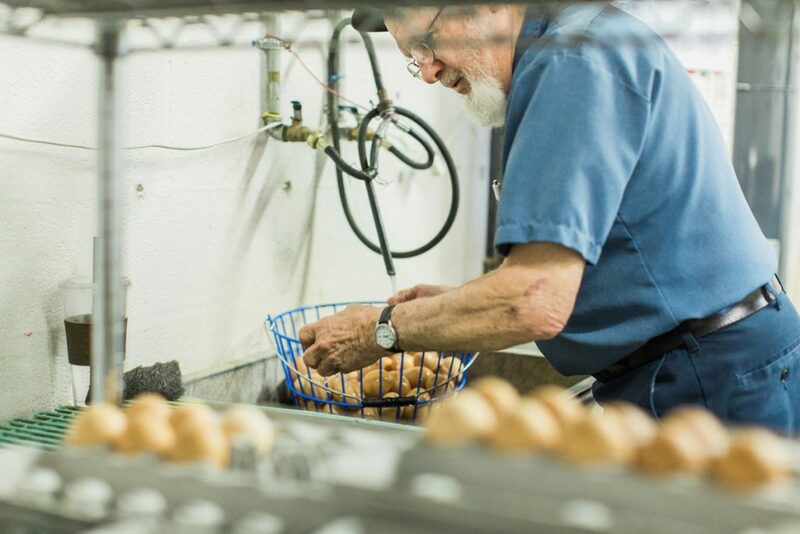 Our all-natural brown eggs are gathered by hand each day for storefront pick-up, wholesale, and regional delivery. Two Great Pyrenees dogs stand faithful guard over the flock, protecting our layers from foxes and other natural predators. Layers living a comfortable life produce rich eggs free from contaminants. Free Range Eggs Supply A Host Of Health Benefits Along With Great Taste. In addition to naturally foraging for bugs and worms, our layers self-feed non-GMO feed produced right here at Sunrise Farms mill. We do not overfeed or underfeed, allowing our layers to adhere to their natural feeding tendencies. Our feed is quality assured to contain no added hormones and no antibiotics. 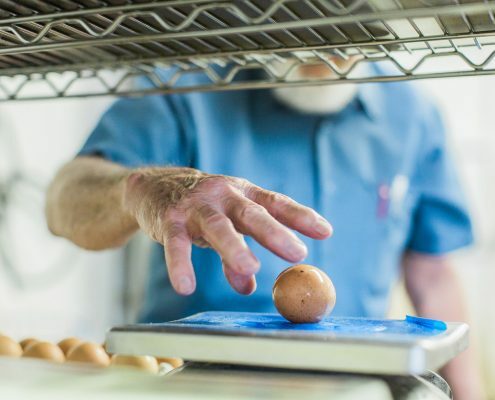 As a result of this commitment to natural methods of raising layers, our free-range chickens produce eggs with high levels of omega-3 fatty acids, folic acid, beta carotene, vitamins E, A, D, and B12. 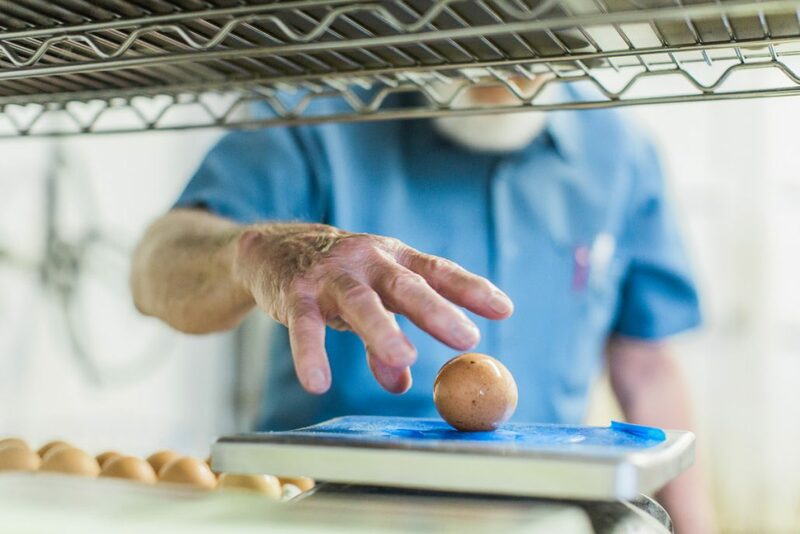 Once Collected By Hand, We Sort Our Eggs The Old Fashioned Way – A Farmer With A Scale! 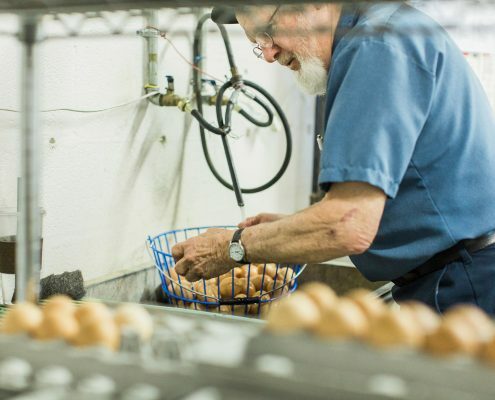 We hand gather all-natural eggs in a range of sizes from young to mature layers. We clean them by hand and then weigh each one to separate them by size. Jumbo eggs are from older chickens and smaller eggs are from younger layers. We have fresh brown eggs for sale daily. We welcome your visit to our farm storefront, located conveniently 3.5 miles off I-64 at exit 91. 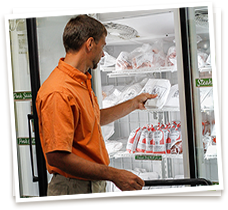 Infuse freshness into your grocery shopping with our large selection of non-GMO meat, eggs, and honey. 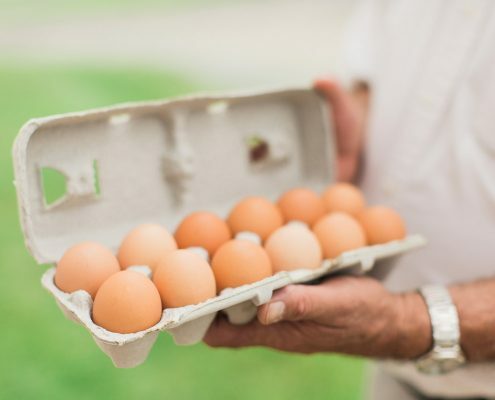 Contact Us For Non-GMO All-Natural Eggs Today.